1. Remove the bracket cover (see step 3 on page 20-91). 2. Adjust the glass (A). -1. 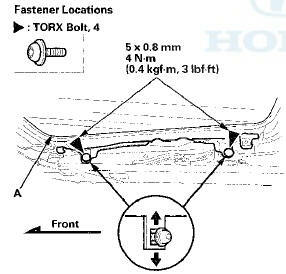 Slightly loosen the TORX bolts with a TORX T25 bit. -2. Move the glass up or down. -3. Tighten all bolts securely. 3. If necessary, repeat on the opposite side. 4. Reset the moonroof control unit (see page 22-371).